Everybody slips on banana peels, and land on the couch. Maggie ends up in Marge's arms. I can not absolve sins"
"Simpsons Bible Stories" is the eighteenth episode of season 10. It originally aired on April 4, 1999. 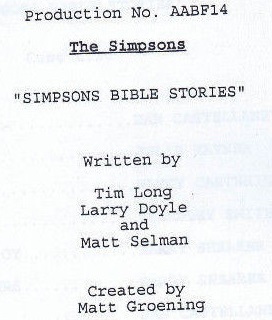 The episode was written by Tim Long, Larry Doyle and Matt Selman and directed by Nancy Kruse. 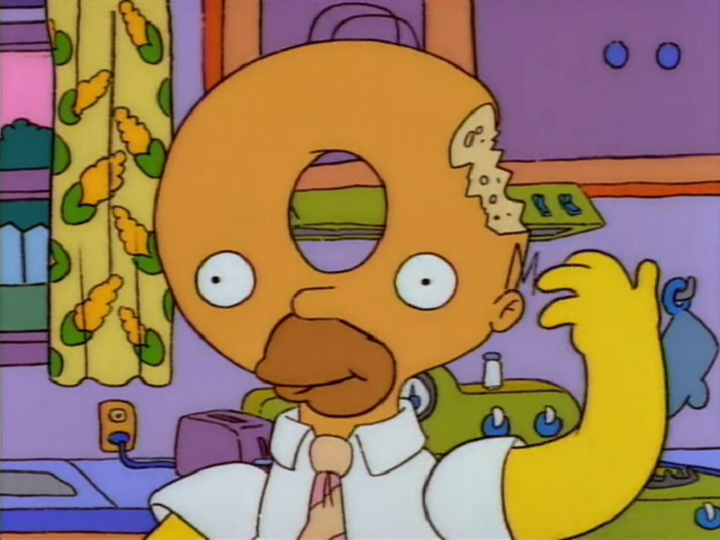 This is one of several Simpsons episodes which are considered anthology episodes that features mini-stories. "A particularly boring sermon by Reverend Lovejoy sends each member of the Simpson family into his or her own biblical fantasy. Marge imagines herself and Homer as Adam and Eve, Lisa dreams of herself and the other kids of Springfield Elementary as the Israelites in ancient Egypt, and Homer dreams he is King Solomon, solving every dispute by cutting the contested object in half." The Simpsons are in church, listening to a long and boring Easter sermon in a sweltering heat. Each Simpson (except for Maggie) falls asleep and has a Bible-related dream. Marge (as Eve) sees Homer (as Adam) fall from the sky onto sharp rocks. Ned (as God) forbids them to eat the Forbidden Fruit. The Snake (Snake Jailbird) tempts Homer into eating loads of the apples. Homer tempts Marge into eating one, but she is caught by God and kicked out of the garden. Adam tries to smuggle Eve back in, enlisting the help of many animals to dig a tunnel. Gary the Unicorn dies in the attempt. They are caught in the act, and Homer is kicked out too. Lisa and Milhouse (as Moses) command Skinner (the Pharaoh) to let their people go. After several failed plagues and an escape from a Pyramid prison, they lead the Israelites to the shore, simultaneously flushing all the Egyptians' toilets to drain the sea. After they have crossed the seabed, the water fills the sea back up, washing away the pursuing Pharaoh and his guards. Moses asks Lisa if they will have an easy life from now on - she tells him they will wander the desert for forty years. When he asks if it's plain sailing after that, she quickly changes the subject. Homer is King Solomon, deciding which of two men owns a pie. He sentences both persons to death, cutting the pie in two and eating both pieces himself. His next case begins: Jesus Vs. Checker Chariot (A paper Jesus has says "My Accident" on it.). Bart wakes Homer up before the case can proceed. Bart (as King David) has killed Goliath, but his oldest friend Methuselah (Abe Simpson) is killed by Goliath II (Nelson). David tries to kill him, mistaking him for Sampson and chopping off his hair, before being thrown by a slingshot away into the mountains. David tells Shepherd Ralph Wiggum of his plight. Ralph tries to kill Goliath II but dies trying. David sneaks into Goliath II's tower, which is blown up in the ensuing battle. Goliath II emerges from the flames, ready to strike, when Ralph kills him with his own tombstone ("Ralph! I thought you were dead!" "Nope!"). David is then thrown in jail for Megacide, since the people agree Goliath II was a better king than he ever was. The Simpsons wake up in an empty church. Marge is ashamed they fell asleep in church, to which Homer answers "It's not the end of the world!" As they walk outside, they discover the Apocalypse/Rapture is upon them. The Flanders go to Heaven (because of them being extremely devout and going to church a lot) while the Simpsons go to Hell (because of them not having Christian beliefs although they go to church.) Lisa is the only one going up to Heaven, but Homer pulls her down, saying "Where do you think you're going, missy?" A stairway opens to Hell, and they enter. Homer can be heard screaming: "They're out of hot dogs! And the coleslaw has pineapple in it! Ahhhhhhhh! German potato salad!" The credits have the song "Highway to Hell" by AC/DC playing. The episode was pitched by Bob Bendetson and would later lead to the creation of "Simpsons Tall Tales". Colin Jacobson of DVD Movie Guide gave the episode a negative review saying "The “Treehouse of Horror” episodes pull of the trilogy thing well, but this Easter special proves less successful. I just think the brevity required by the inclusion of three separate tales better suits the world of horror spoofs than it does these Bible pieces, as they try to pack an awful lot into very little time. Some good moments result anyway, but I don’t find a lot of entertainment"
The Sherwin Miller Museum of Jewish Art in Tulsa, Oklahoma, revealed a new exhibit which galleried Biblical images in art and pop culture, including a promotional poster for "Simpsons Bible Stories." Modified on April 21, 2019, at 08:42.